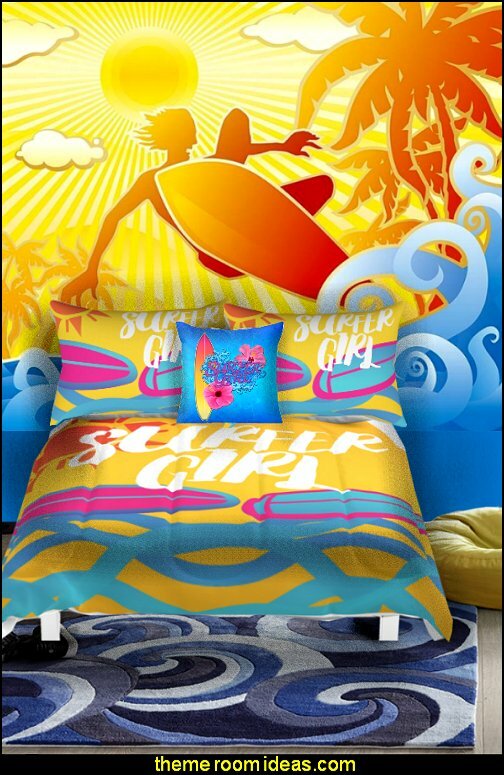 This is a wonderful decorating theme for your surfing dude and surfer chicks! 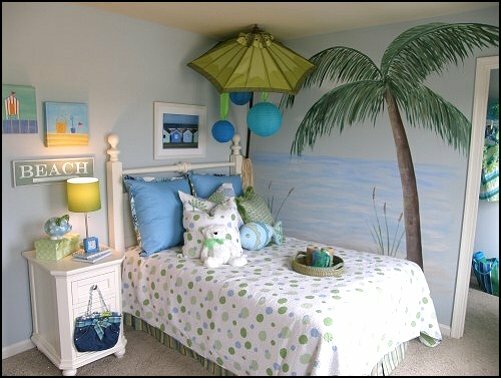 Beach, ocean and waves will come to life in their beach themed rooms! 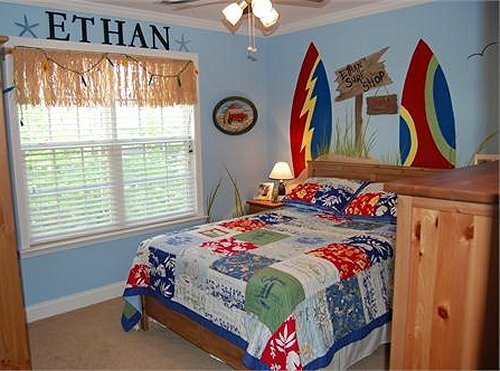 There are so many options for the beach themed bedrooms - from sea shore, waves and sharks, surf shack beach side, nautical sailing boats and yachts, cool coastal colors with rustic furnishings and accented with seashells. 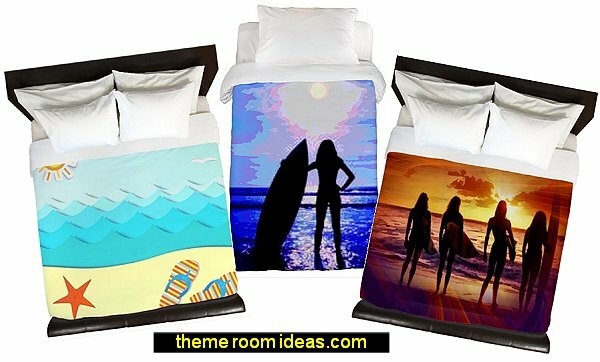 Or underwater themed, with scuba divers, ocean animals and a mermaid or two. 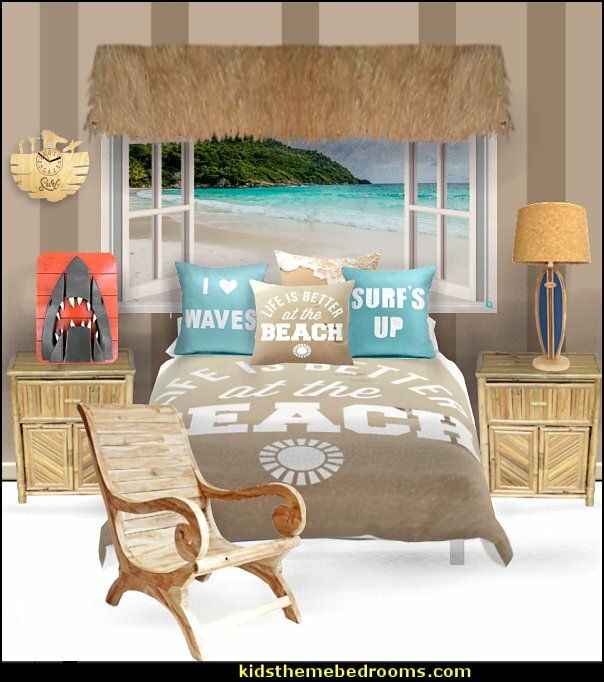 Beach Party Kit features surf-styled party props that are sure to have your guests movin' and groovin' inside the surf shack! 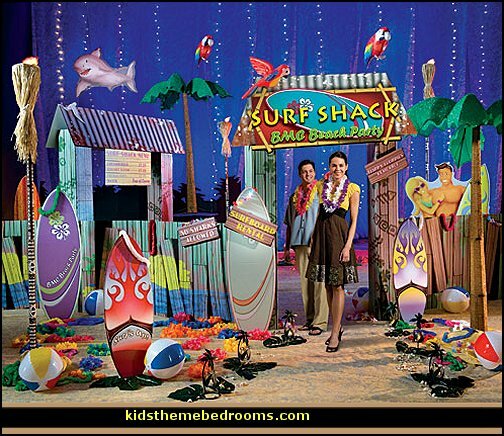 your guests can visit Hawaii when you throw a luau party! 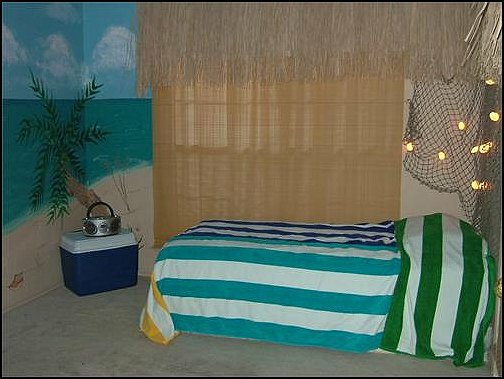 Luau decorations can also work as beach decorations, Hawaiian party decorations, and tropical decorations. 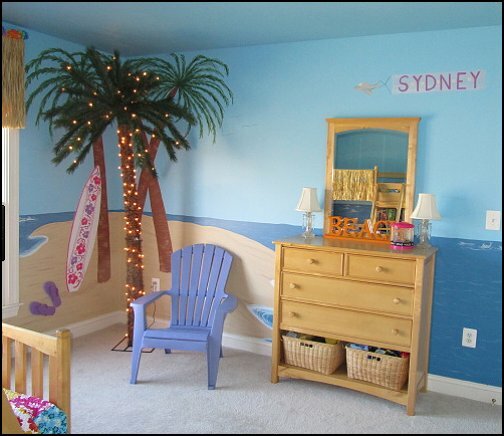 They transform your room, deck, or pool area into a believable island escape. 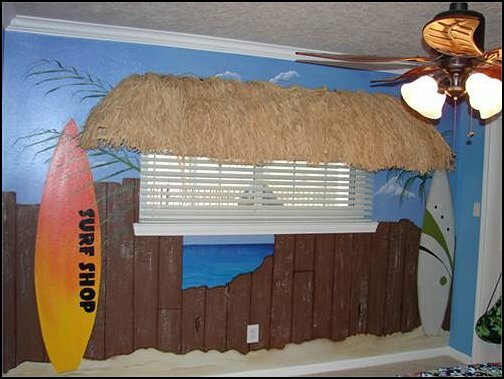 Park your surfboard standees at the door, and belly up to the tiki bar for some tropical paradise fun! 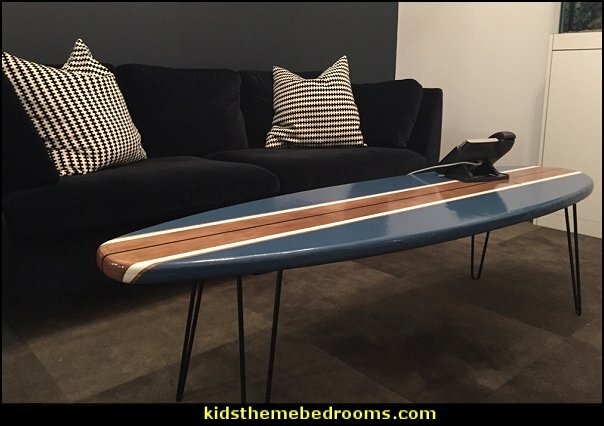 This Surfboard is 10" x 36 ". 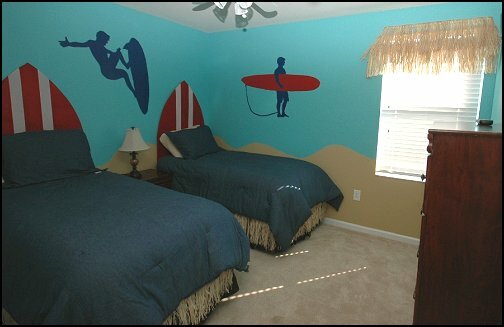 Made out of 1" Pine Board. 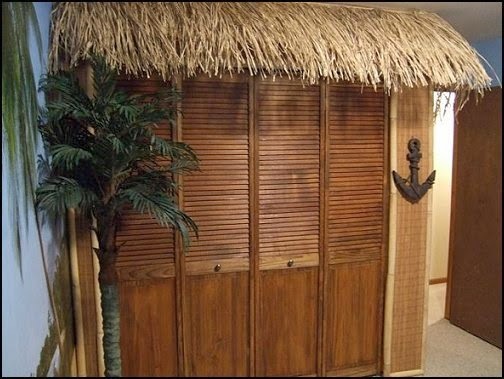 It is Trimmed with a Jute Cord and hangs on 2 saw tooth picture hangers. 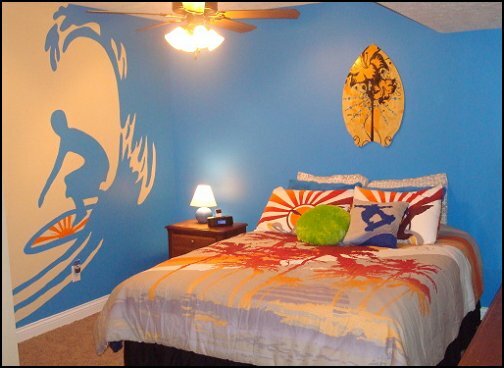 This Piece is Hand Painted with Layers & Layers of Paint. 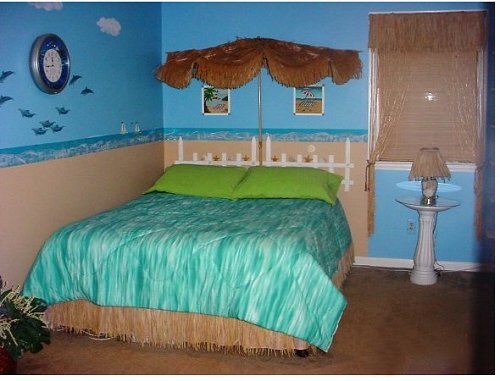 Even the little dots on the Umbrellas are raised & added seperately. 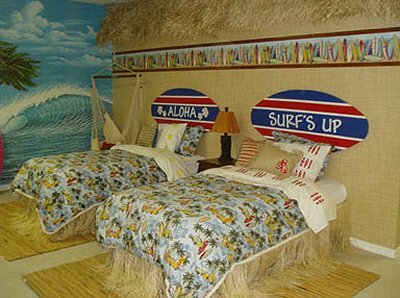 These are Truely a Piece of Whimsical Art. 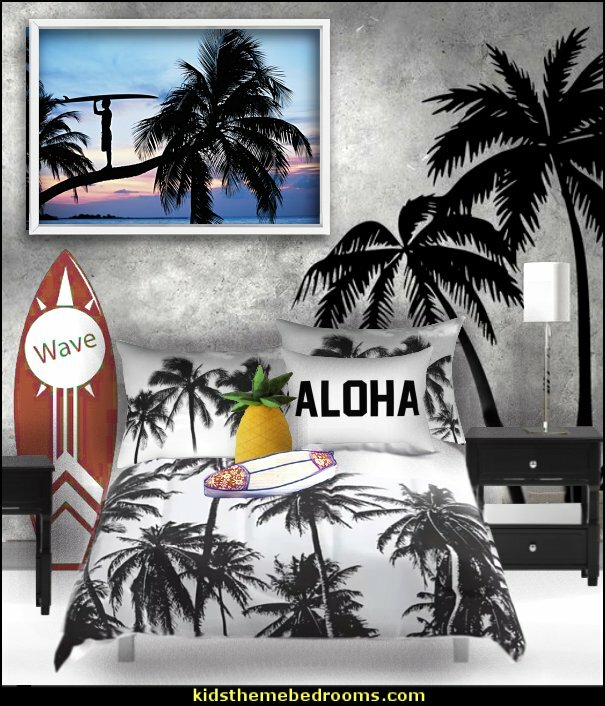 We paint these at time you pay for the order, so if you wish we can change the wording even on the Pointers on the Palm Trees. Just let us Know when ordering thru Etsy Notes. They are sealed so they can be hung inside or out. 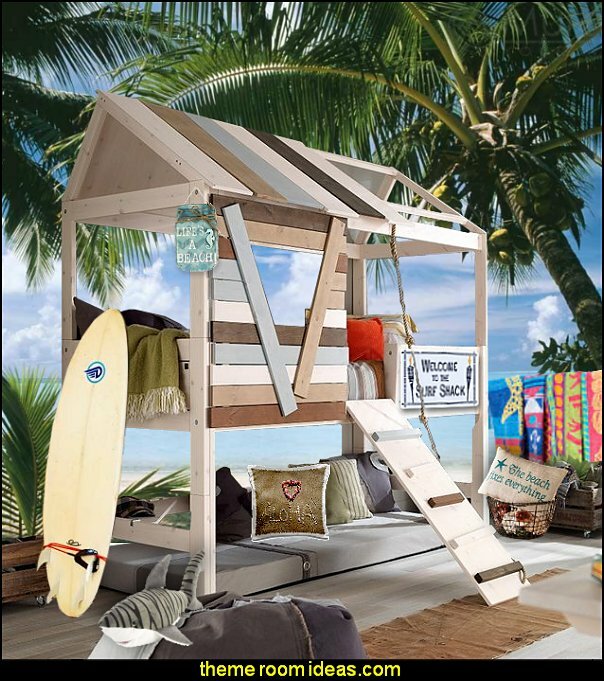 Loft comes in a stunning rustic pearl finish and Cabana design, so your child feels like they are on their very own retreat. 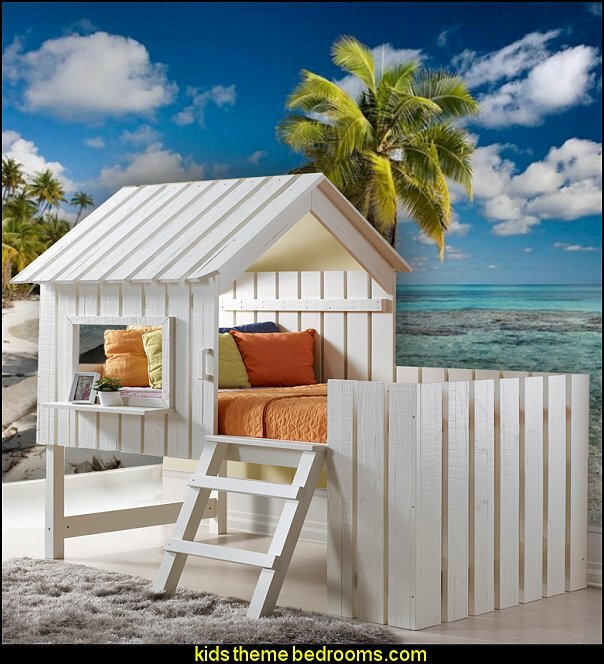 The fixed ladder allows easy access to the top bunk, enclosed by a solid wood barrier and house like the front, allowing your child to play safely in their Cabana. 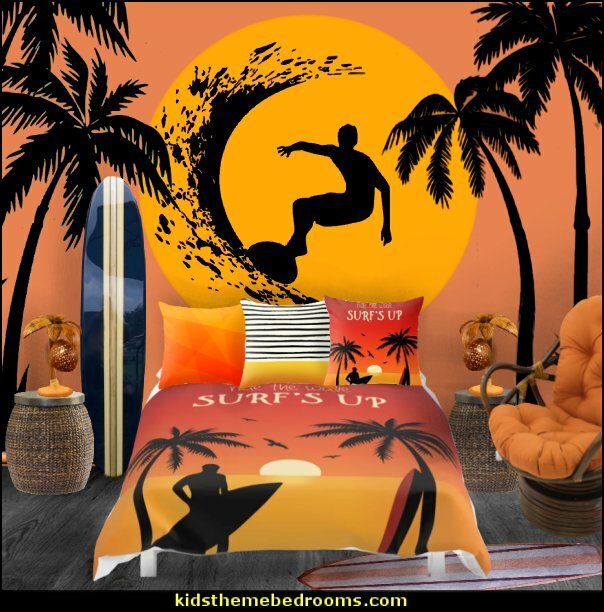 This board has realistic features and dimensions of a real surfboard. 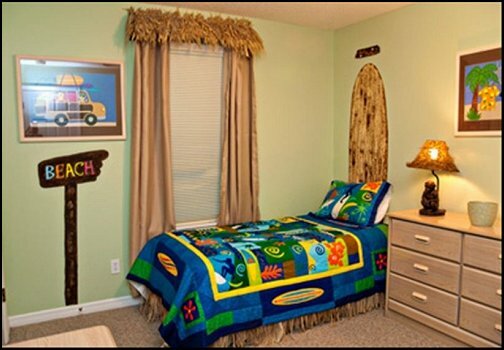 The board is 60" Long by 19 1/2" Wide and 1 1/2" Thick. This coffee table stands 16 1/2" tall. 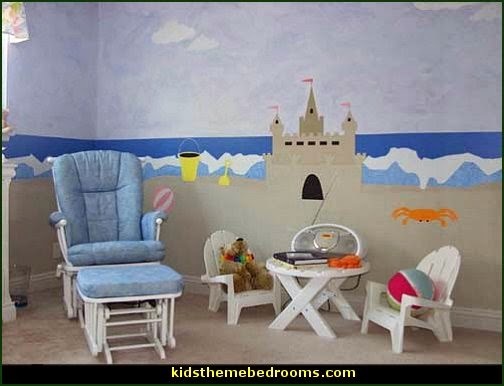 It is made of furniture grade plywood and finished with four coats of varathane. 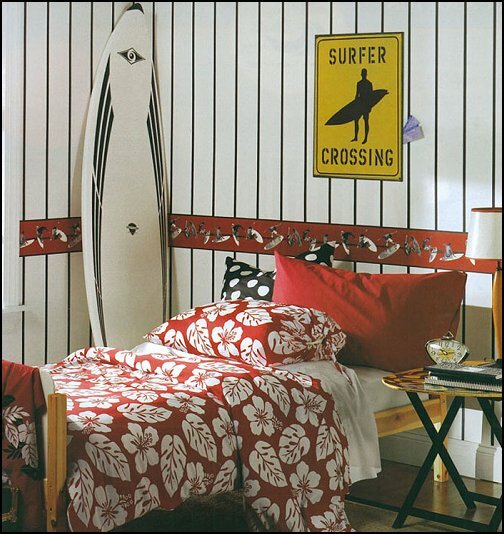 We take a few extra steps to wet sand and polish our boards to give it a durable and mirror glossy finish. 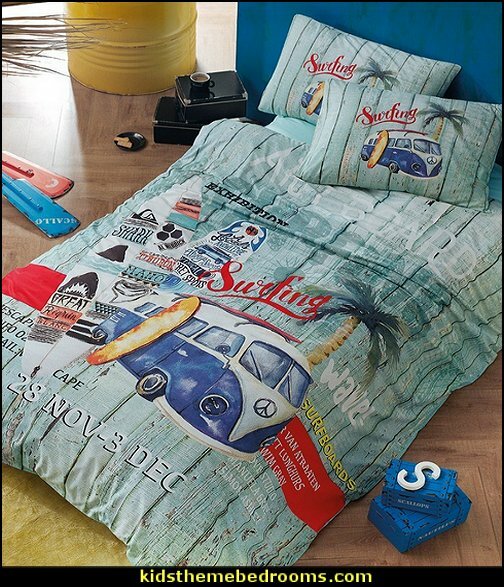 We offer customization for this item. 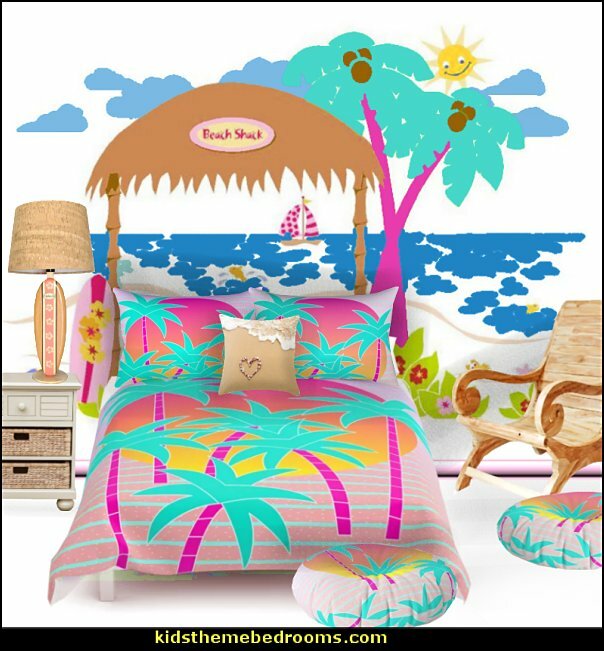 Transform your bedroom into a tropical Caribbean island inspired getaway with white sandy beaches, colorful bedding, palm trees and island blooms. 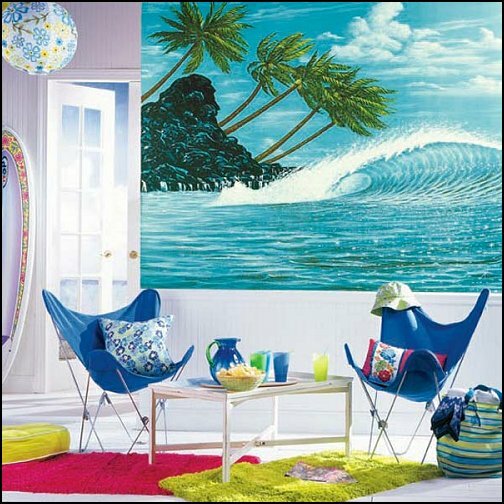 The sea has always fascinated us and has proved a particular source of beautiful inspiration with its range of plant and animal life in varying shapes, sizes and colours. 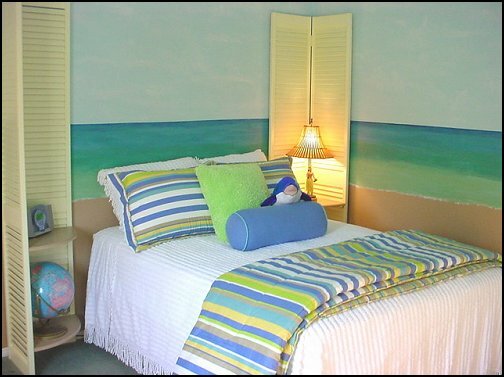 This highly original book captures the essence of the seashore. 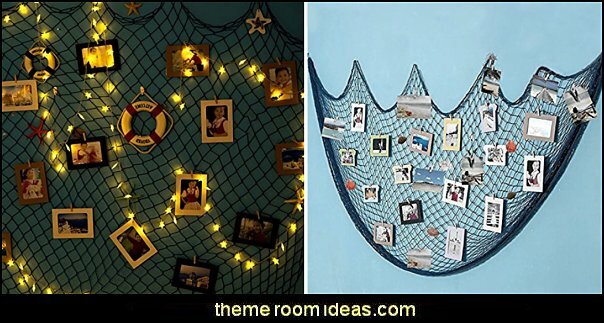 Following a series of evocative photographs, you are introduced to a spectacular variety of motifs and materials of the seashore - all combining to create a hauntingly magical atmosphere. 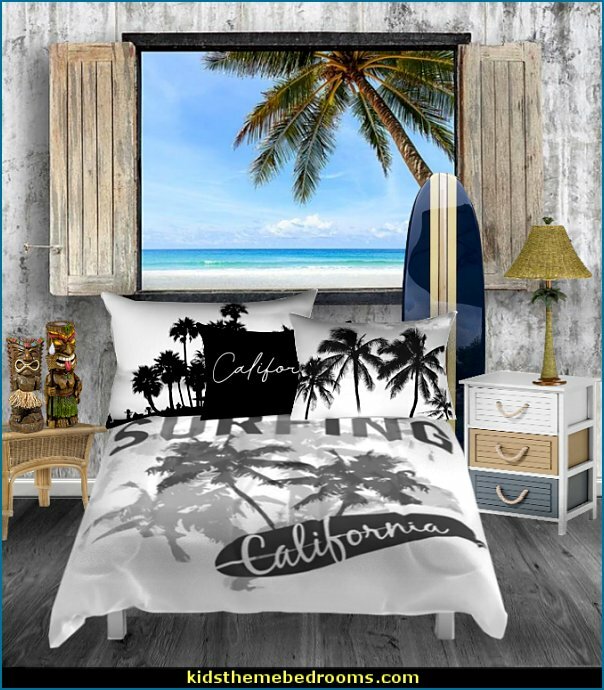 In the main section you are shown how to create your own superb seashore effects throughout the home, including fabrics, furniture and domestic surfaces. 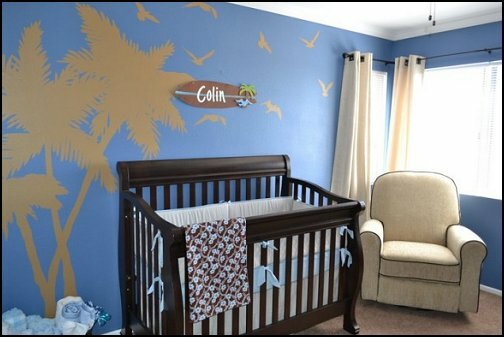 Alongside the many inspiring ideas are 35 practical projects, each presented with easy-to-follow, step-by-step photography to show you what to do at every stage. 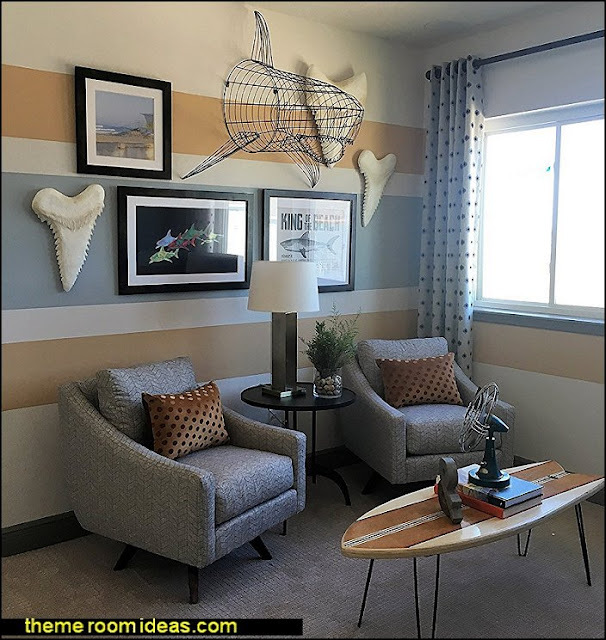 Whether you wish to make a string-and-driftwood chair, distressed painted louvred doors or a shell-encrusted mirror, everything you need to know is carefully explained and demonstrated, giving you the confidence to try out your own designs. 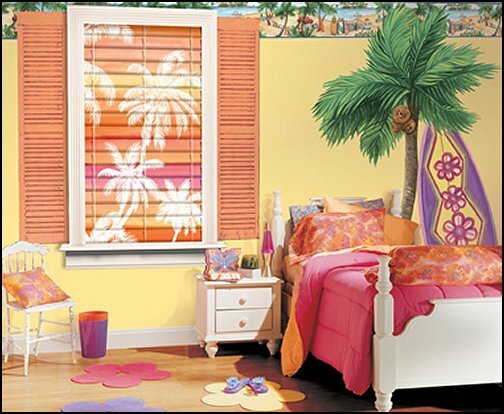 Set your room ablaze with the vibrant hues reminiscent of laid-back sunny days spent shore side.